Selling your house and moving is NOT sweet and it is NOT an everyday event for a family. It is disruptive, stressful, emotional, and there is a lot of exhausting work to be done. Most aren’t prepared, no matter how hard they try. This is why the Classic Staging Walk and Talk Home Staging Consultation is so important. It is a professional, concise presentation, and personalized analysis of your house. This is not the time to be distracted by your phone, dog or kids. THIS is the time to be mentally present, take notes and trust the advice given. Recently, I found myself standing on the sidewalk at a shopping center. I put down my phone and was purposely present in that moment. I took in the scene around me: to my left was a grocery store, my right a locally owned, family restaurant, and I watched people come and go. Some hurrying in and out of doors, others passing casual greetings, while others embraced. I noticed one young woman escorting her elderly grandfather out of the restaurant. After their goodbyes, she stood aside in the shadows and watched to make sure he got to his car safely. It was a sweet scene. What does this have to do with Home Staging you ask? While there are times to be busy and hurried, there are also times to stop, put your phone down and pay attention. Selling your house and moving is NOT sweet and it is NOT an everyday event for a family. It is disruptive, stressful, emotional, and there is a lot of exhausting work to be done. Most aren’t prepared, no matter how hard they try. This is why the Classic Staging Walk and Talk Home Staging Consultation is so important. It is a professional, concise presentation, and personalized analysis of your house. This is not the time to be distracted by your phone, dog or kids. THIS is the time to be mentally present, take notes and trust the advice given. 1) Staged houses really do sell for more money! 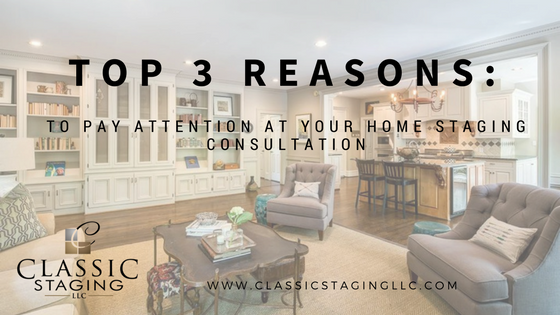 Classic Staging projects sell 50% faster on average. 2) You and your Realtor are a team and will be responsible for implementing the changes being discussed! How will you know to remove Grandma’s porcelain fruit basket from the Dining Room table or which color to paint the kitchen? Take notes! These will become your Action Plan for success. 3) You want beautiful listing photos! How do Buyers find a home? Online! The way your house looks in pictures gets you on the “go see” list. How it looks in person keeps your buyer interested! If you are present, take notes and do the changes and updates suggested by your Home Stager and Realtor, it is likely you will sell your home quicker and for more money. Call an ASP certified Home Staging Professional for a consult today! Stage.Sell.Simple. It’s Classic®!